The Australian Institute of Family Law Studies have released their evaluation of the 2012 family violence amendments this week. In 2012 family violence amendments were made to the Family Law Act. 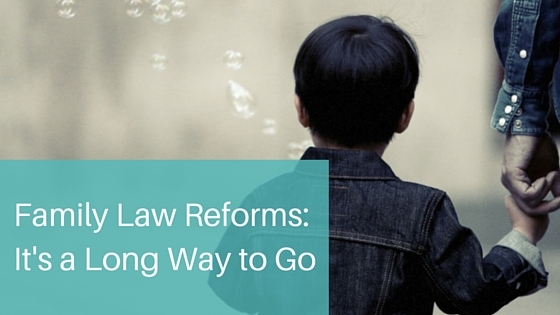 The changes strengthened the screening processes for family violence of child abuse during family law matters. This included the obligation of family law courts, mediators and family law solicitors to lead a line of inquiry into whether or not separating parents have concerns of violence or abuse. According to the report, 1 in 5 parents had concerns for their safety or their children as a result of ongoing contact with the parent. Most separated parents participating in the research made limited use of family law system services. Those who used formal services tended to be affected by complex issues, such as family violence, substance misuse and mental ill health concerns. Our evaluation, carried out two years into the reforms, indicates that the family violence amendments have influenced a shift towards more scrutiny of parenting arrangements. An analysis of family law court files showed fewer children were in shared care arrangements where there were allegations of family violence or child abuse, down from 19 per cent prior to the reforms to 11 per cent after 2012. Yet, despite modest improvements there’s still plenty way to go. It seems that despite reform the whole apparatus for dealing with family law matters and family law violence needs to come under review. Dr Kaspiew said the research highlights reservations among family law system professionals about the capacity of the system to adequately deal with cases involving family violence or child abuse concerns. “The research shows that further refinements in practice are required along with the development of more effective screening processes which still have some way to go. A greater number of cases now have Notices of Risk filed (an increase of almost 100%) and are consequently referred to child protection agencies. Professionals are worried about the burden on child protection agencies and delays for the children involved”, she said. A significant 3 in 10 separating parents interviewed during their family law matters, by lawyers, courts or professional mediators during dispute resolution, said they had ‘never been asked’ about family violence or whether they hold concerns for the safety of their children or themselves. Have you been through mediation proceedings since 2012? We’re you asked about concerns for your safety or a history of family violence? Let us know int he comments section below.